Things have been progressing at a nice pace. We are booked into a preparation group in the autumn, which gives us time to move house (fingers crossed). Little City adoption agency has been in touch and we will be meeting with them in the next few weeks. As Little City and Rural share training, we don’t need to decide between them until we put in a formal application after preparation group training. The government, however, is changing the way adoption agencies assess prospective adopters. Things may look completely different after July 1st, meaning we will be pushed by government KPIs (key performance indicators) to apply and be approved as soon as possible (four to six months). The alternative is that we bring down the statistics for our chosen adoption agency. The cost of these changes is that vulnerable people who are not yet ready to adopt will either be rejected at panel or rushed into parenthood. Well, I suppose if those people wanted to take their time, they would. I’m not sure it will make the system better though — preying on people’s intense desires to be parents. Because of these changes, I have made it clear to the adoption agencies that hand-stitched dad and I will be taking our time. The last thing I want is for an over-eager social worker to try to rush us, our report, our link, our match, our introductions, our *anything*. Thankfully, Rural adoption agency has been very supportive of our plans. This has increased our trust in this agency to the point where it would take a lot for Little City to impress us. Rural has demonstrated a commitment to getting to know us and maintaining a continuity throughout the various hoops placed before us prospective adopters. The attitudes of the staff have all been ‘on message’ aka consistent and clear. Finally, they have demonstrated their understanding of what we have to offer and what we have to learn. This has set the bar rather high for Little City. I feel like my mind is already made up. But that is not how it works. A lot can change before 2014. It is important we stay flexible and only commit when the time is right. There is still an awful lot of work to do. The first time we inquired with Big City adoption agency, they sent a big packet of information plus a DVD. Hand-stitched dad and I found the DVD very helpful (if not a little clinical and scripted) as we both prefer visual learning aids. The second time we inquired with Big City adoption agency, we filled out an online form and someone called us several weeks later to take our details. In hindsight, we probably should have asked whether this person was a part of the adoption team or a social worker, as it turns out they were just an admin in a special data collection team! The phone call ended with a verbal invitation to their information meeting in five days and an assurance that the adoption team would send a letter invite out. 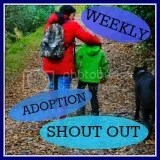 On the day of the adoption information meeting, we received a call from the same person asking for our details again. I kindly reminded her that she already took our details and we were still waiting for the invite to the information meeting. Coincidentally (! ), we also received a call from a Big City social worker asking if we would be attending the information meeting that evening. Um, no? They apologised for not sending the letter through and assured me that they would send an invite to us for the next information meeting. A couple weeks later, we still haven’t received an invite. We did, however, get a call from a member of the adoption team who was interested in progressing our application and wanted to “see where we are.” I advised her that we still have not received anything from Big City regarding the information evening. She apologised. I asked for the details over the phone. She said she would send them through email. We confirmed our correct email address. She said she would “send it in the next thirty minutes” and that we should review, print and call to RSVP. It probably is no surprise, but we still haven’t received this email. Big City adoption agency already had a few marks against it, and our initial experience has done nothing to improve our opinion. We wanted to give it a fair chance against the other two agencies, but that is becoming a lot less likely! So with Big City out, that leaves Little City and Rural adoption agencies to decide between. As we had attended an information meeting for Rural adoption agency at the end of 2012, the next step was to speak with a member of the social work team. She called in the middle of the day and asked if I had approximately an hour to complete the viability assessment. “Doesn’t my husband need to be present?” The administrator had said we would both need to be present for the conversation. The social worker said no, it wasn’t necessary unless we wanted to both be present. I knew hand-stitched dad would much prefer me to do the talking, so I said it was okay to go ahead. “I’ll do my best to answer for my husband.” And I made an effort to reflect on what we both might answer and shared honestly, even (especially!) when they differed. My first impression of the social worker was that she had a bright voice and sounded kind and considerate. I wondered if she had counseling training, as she listened well. I felt comfortable talking with her. Then, she explained about the process of adoption. I listened carefully, but was secretly pleased that I already knew everything she shared. She specifically emphasized the need for contact with birth families. She asked for my thoughts. I said we had no problems with contact, as long as it was in the best interest of the child and “everyone involved agreed to review it as the child develops.” The social worker was impressed by this answer and explained a bit more about how contact was decided. She asked if I had any questions. I asked her for advice on timing our house move . She said that the best time is before the child is matched and placed, as any changes will be too disruptive. I was relieved that we wouldn’t be excluded from the process because we were considering moving house. There is no guarantee it will sell! I had other questions, but the social worker sounded pretty eager to share the results: she was recommending that the Rural adoption agency proceed with our enquiry! She said that she could tell from my answers that I valued transparency and honesty. She said that it was clear we had taken time to gather information and prepare ourselves for the next step. She said it was good that hand-stitched dad and I had different personalities and strengths as we would balance each other. She then asked how I would describe our relationship. I thought immediately of what my counselor said years ago. “Devoted” I mused. ” ..that’s what others have told us.” I swear, the social worker smiled. The social worker explained that her report will be reviewed by the monitoring group, who then decide whether to proceed. They have responsibility for prioritising prospective adopters’ enquiries to meet the needs of children currently in care. The social worker advised us that we would receive a letter with the results of the review. She also hinted that there may be a wait due to the current backlog of enquiries as a result of a recent marketing drive. Again – not a concern for us, as that gives us more time to get the house sold! I told her we were not in a hurry. The social worker finished the conversation by giving her full name and contact details. She advised us to call her if we had any further queries or wanted an update on the process. We haven’t had a need to call her yet, as we understand the process fairly well. I may give her a call if we do not hear from them in April. Overall, my experience of the viability assessment phone call was very positive. Despite our increasing knowledge of adoption, hand-stitched dad and I are ‘utter newbies’ and lack the confidence that experience brings. We sometimes feel inadequate as prospective parents, so it is validating to get such a positive response from a social worker regarding what we have to offer. The social worker sounded genuinely excited to meet us. She did her best to reflect our answers and provide feedback. It felt nice to have someone recognise and value our strengths, while keeping in balance our vulnerabilities. I called hand-stitched dad immediately after the assessment, and he was amused at my excitement: “I can tell; you sound really pleased.” I chattered about every single question the social worker asked, on the phone and again at home. Hand-stitched dad confirmed that I did a good job representing both of us. Two weeks later, we received the letter from Rural adoption agency. The letter confirmed that they would like to proceed with us and that the next step would be a home visit from a social worker. They said that they would contact us as soon as possible in April to arrange a time. We look forward to hearing from them!